Randy Robertson is a fictional character appearing in American comic books published by Marvel Comics. He is a supporting character in Marvel's Spider-Man series and is depicted as the son of Robbie Robertson. Created by Stan Lee and John Romita Sr., he first appeared in The Amazing Spider-Man #67 (December 1968). Randy Robertson, son of Daily Bugle city editor Joseph "Robbie" Robertson, enrolled at Empire State University a year behind Bugle photographer Peter Parker. A boisterous hothead unlike his even-tempered father, Randy quickly became involved in student activism, albeit usually as the voice of moderation to the more radical Josh Kittiling. On his father's advice, Randy sought Peter's friendship, although Parker's double life as Spider-Man left him little time to help Randy promote social change. The day after meeting Peter, Randy joined Josh and other in protesting E.S.U. 's plans to turn an exhibition hall into a dorm for visiting alumni, rather than for needy students. The crime boss Kingpin interrupted their demonstration to steal the lifeline Tablet, allegedly containing the secret to longevity. When Spider-Man intervened Randy tried to restrain Kingpin. He was easily knocked aside, but following Kingpin's defeat, Spider-Man did not forget Randy's act of courage. 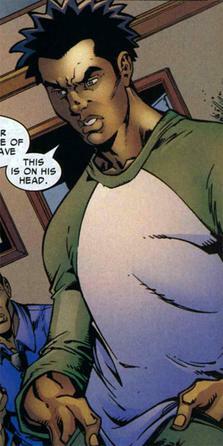 Randy soon joined Peter's circle of college friends, although he was rarely drawn into Spider-Man's activities at E.S.U. and elsewhere in New York City. His rebellious streak eventually faded, and after graduating from E.S.U. Randy pursued graduate studies in social work at Pittsburg State University, where he met and married fellow student Mandy Batavides, a Jewish woman. Randy gave up social work to become an actor, much to his father's disapproval. [volume & issue needed] Renewing his friendship with Peter whose own wife Mary Jane Watson was believed dead, Randy offered to share his apartment with the widower. The two men became roommates, although Randy tended to spend more time with their mutual friends Glory Grant and Jill Stacy, little realizing the hazards he and Peter were sharing such as nocturnal experimentation by the extraterrestrial Brll'nah>zhhk< and drugged toothpaste from the Green Goblin. Following a direct encounter with Green Goblin, Randy sought advice from Robbie as his father had significant experience with super-villains from his Bugle position. [volume & issue needed] While Randy and Glory began dating, Peter could not return Jill's flirtations. [volume & issue needed] Peter moved out after Mary Jane turned up alive. [volume & issue needed] Once Peter joined the Avengers and moved into Stark Tower, Randy lost touch with the Parkers. [volume & issue needed] Randy was seen briefly at the Robertson's household after Robbie was fired from the Bugle. [volume & issue needed] Randy recently reappeared in The Amazing Spider-Man and began dating a reporter from the Front Line named Norah Winters. Later, Phil Urich is jealous of Randy for dating Norah. When Alistair Smythe’s minions attack the Front Line offices Phil breaks a support beam. This, along with the damage caused by the attack, causes the ceiling to collapse on Randy. Randy survives the collapse, but he is seriously injured. During the Spider-Island storyline, Randy Robertson goes to assist Norah during the outbreak. During this time, he is attacked by the Hobgoblin (Phil Urich) when the villain had been trying to break them up for quite some time. To his surprise, Randy is one of the New Yorkers given spider powers. With his newfound powers he is able to fend off the Hobgoblin for some time, but begins to lose because of his lack experience. While almost meeting his death, Norah is entranced in reporting the whole thing and misses an opportunity to save Randy. Randy manages to fend off the Hobgoblin, but decides to break up with Norah, citing that she cares more about the story than his life, or hers. However, his mutation, like the millions of others in New York City, turns him into a monstrous spider-being. Randy and the rest of the civilian population were eventually cured when Spider-Man uses Doctor Octopus' octo-bots to disperse the antidote. Randy and Peter started living as roommates again in the recent Amazing Spider-Man run by Nick Spencer. On Earth-65, Randy Robertson was a rock 'n' roll reporter, and friend of The Mary Janes. He tried to convince the band's leader Em Jay Watson to ask for Gwen Stacy to return to the band. Randy Robertson appeared in two episodes of Spider-Man: The Animated Series, voiced by Alfonso Ribeiro. In the series, he was a typical rebellious teenager, highly immature, always getting into trouble and easily influenced by the wrong crowd, much unlike his responsible father. He foolishly believed that his fellow gang of delinquents and hoodlums cared for him more than his loving father and soon became an underling of Tombstone, a criminal who has a personal vendetta against Robbie Robertson and wanted to use the boy to destroy his family's reputation. With Spider-Man's help, he managed to learn the error of his ways and reconciled with his father. When his father was framed for armed crime by Tombstone and Kingpin, Randy blamed Spider-Man for his less-than-helpful involvement in the crime scene despite Spider-Man having helped him and his father before. Randy Robertson also appears in The Spectacular Spider-Man, voiced by Phil LaMarr. This version has quiet laid-back nature. This easy-going charm is quite a contrast from the fiery, militant his incarnation from the comics. He is on the Midtown football team with Flash Thompson and Kenny Kong, and is dating Sally Avril (although he seems less than happy about that fact in the episode "First Steps"). Rand is the nicest and most neutral of the football players, even protecting Peter Parker from Flash's water balloon barrage. He considers Col. John Jameson like an "older brother" and fears for him when his space shuttle experiences distress on a mission (which irks Sally who seems not to get it). In the first season finale, Randy helps catch Gwen Stacy after she is hurtled to the street by Venom. Randy Robertson appears in 2017 Spider-Man animated series, voiced by Zeno Robinson. While he is shown to be a student at Midtown High School, Randy is also the owner of his own blog as seen in "Screwball Live." In the episode "How I Thwipped My Summer Vacation," Randy runs into Peter Parker on the street and helps him get a job by having his father hook him up with J. Jonah Jameson. ^ "Amazing Spider-Man Being Relaunched By Spencer & Ottley". Comic Book Resources.com. 2018-06-23. Retrieved 2018-06-23.